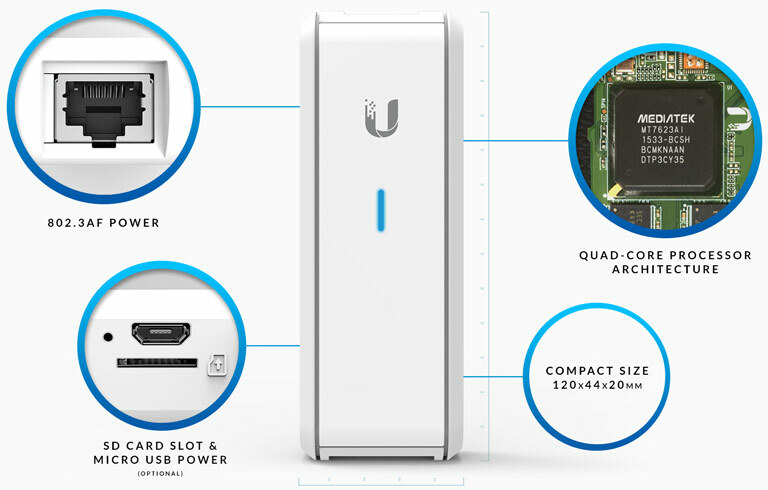 The Ubiquiti UniFi® Cloud Key is micro computer with Ubiquiti’s UniFi® controller pre-loaded. Combined with the Ubiquiti UniFi® USG or correct port forwarding, the UniFi® Cloud Key can become a hybrid cloud controller allowing external access through a sites public IP or internally through a local IP. Big things do come in small packages. We took one of our biggest ideas and engineered it to fit into a tiny form factor. Introducing the UniFi® Cloud Key, a miniaturized marvel of technology. The UniFi® Cloud Key is fully capable of configuring and managing dozens of UniFi® devices in your deployment. Replacing a dedicated server or computer, the UniFi Cloud Key is an ultra-low energy solution with virtually no footprint. The Ubiquiti hybrid cloud configuration provides a secure, private SSO (Single Sign-On) to access all of your UniFi® deployments from anywhere in the world. With the Ubiquiti hybrid cloud, a third-party hosted cloud service is not required, so all of your personal data and network information remains local and secure the way it should be.